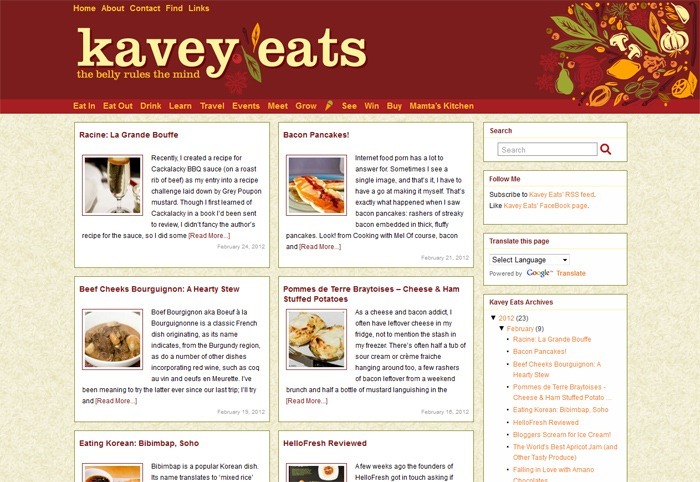 Welcome to the new look Kavey Eats! But finally it’s done! I’m so happy with it and am delighted to welcome everyone here! Huge thanks to Pete, enormous thanks actually, absolutely huge. A big smile to Amee and Ray for their banner graphic design services. And thank you to the two Matts (Gibson and Inwood) for their input. Would love your feedback, so please let me know what you think. And of course, if you experience any glitches, leave a comment or drop me an email so I can get to fixing them right away! 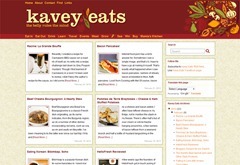 22 Comments to "Welcome to the new look Kavey Eats!" Hi Kavey, it looks wonderful! Really lovely, clean layout, easy to navigate, this must have been a huge job for you all but well done 🙂 I LOVE the little ice-cream icon in the tabs – too cute! This looks fantastic. A nice clean design. Very professional. It looks great, very professional. Looking good. Especially love the banner! Looking good Kavey, easy to navigate too. Oh I just notice you’re using the rice background from Mamta’s Kitchen too. I like how that’s tied in. Looks gorgeous! Pete is a saint! Can imagine the hard work he put in. Well done all. Looks great – I love it! It is lovely; clean, easy to navigate around for less computer savy people like me and great colours. It must have taken you hours upon hours to get it right. Well done to both of you :-)! Congratulations, Kavey. It is beautifully done, its clarity a gift to we your grateful, faithful readers. do you know what, it looks great and if you don’t mind me saying, it’s about bloody time as your old one was looking a little scattered and not the sophisticated and stylish look that a blog of your standing and standard deserved… bloody good work! I love your re-vamped blog – its ace! The banner graphic is really good too! It’s clean and easy to use, welcoming and enticing! Well done. First time here, but your page looks phenomenal!! Thank you all, so glad everyone likes it. Brilliant, just like everything you and Pete do.